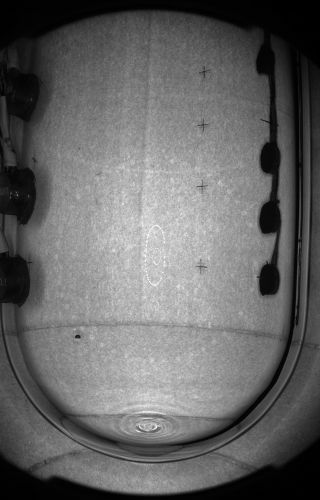 Image of one of the first bubbles seen in the COUPP-60 detector, located half a mile underground at SNOLAB in Ontario, Canada. The bubble appears as a black semi-circle on the lower left-hand side of the image. The white ovals in the center are reflections of LED lights. A new hunt for dark matter — an invisible but bountiful constituent of the universe — is under way inside an underground laboratory a mile and half below Ontario, Canada, scientists report. The project, called COUPP-60 (the Chicagoland Observatory for Underground Particle Physics), is a 30-liter chamber filled with 132 lbs (60 kg) of purified water and CF3I — an ingredient in fire extinguishers. The researchers hope to catch dark matter particles on the extremely rare occasions they interact with normal matter by observing bubbles formed when dark matter hits a particle in the detector. But once in a very rare while, it should hit something, and that's what the COUPP-60 researchers are counting on. "Our goal is to make the most sensitive detector to see signals of particles that we don't understand," Hugh Lippincott, a researcher at the Department of Energy’s Fermi National Accelerator Laboratory in Batavia, Ill., who led the installation of the detector inside the SNOLAB facility in Ontario, said in a statement. Scientists install the COUPP-60 detector a mile and a half underground at SNOLAB in Ontario, Canada. The water inside COUPP-60 is kept at a temperature and pressure just above boiling, though to form a bubble the material requires a small extra jolt of energy. An impacting dark matter particle could provide just such a jolt, so the chamber is tuned to detect bubbles when they form. Other particles could also hit the atoms in the detector, which is why it's buried so deep underground in an effort to shield all but the most resilient of particles from reaching it. It's also submersed in 7,000 gallons of water, which provides an extra layer of shielding. Some non-dark matter particles still get through, though, so the researchers have sophisticated methods of trying to screen out false-positive signals. True dark matter impacts should be exceedingly infrequent. Already the project has seen a few bubbles, but it's too soon to tell whether they were caused by dark matter or something more mundane, the scientists say. COUPP-60 is just one of a suite of underground dark matter-hunting experiments; others include the XENON Dark Matter Project in Italy, the LUX (Large Underground Xenon) experiment in South Dakota, and the SuperCDMS (Cryogenic Dark Matter Search) experiment in Minnesota. There's even a particle detector installed on the International Space Station called the Alpha Magnetic Spectrometer that hopes to find the elusive stuff. Some of these experiments have been running for years, but none have yet found a reliable dark matter signal. The detectors are continually being updated to become more and more sensitive, so that could change in the near future, though.